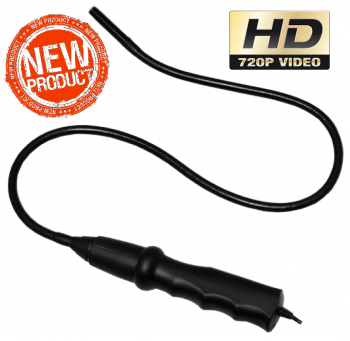 The Digitech-i USB 720p HD Inspection Camera is an ergonomic handheld video endoscope system with robust and semi flexible insertion tube. It can easily be operated by plugging directly into your computer. Enhanced with 6 white LED lights (Adjustable) on the tip of the semi flexible tube and a High Definition digital camera, it can capture high quality images and videos (AVI) with rich color throughout a large dynamic range. The full package includes user friendly image processing software along with 3 useful accessories (Magnet, Hook and Mirror). Additionally, this high inspection Camera requires no batteries, receiving its power directly from the computer's USB power. It's waterproof head and innovative design, as well as its easy accessibility option make it a perfect candidate for household use, industrial inspection and a nifty spy and surveillance toy.